Beautiful tulips, Mary! I agree about winter and needing inspiration. I am looking forward to spring and seeing flowers and longer days of sunshine. Your idea of using prompts sounds like fun. Happy Sunday and thanks for hosting! I'll gladly join in your weekly prompts - something to get the creative juices flowing at this dull time of year. Your tulips are divine Mary. Even though it is Summer here on the other side of the world, it reminds that Winter provides beautiful flowers too! Thursdays sounds a lovely idea - thank you. May I just say Mary - you and your photos are never boring. Thank you for hosting Mosaic Monday. Thank you for hosting and have a great week. I will be checking back on Thursday for your prompts. Thanks for hosting today, I look forward to joining in with Mosaic Monday. The tulips are beautiful, a reminder that spring will come. Yes, I'll come around on Thursday to check things out. 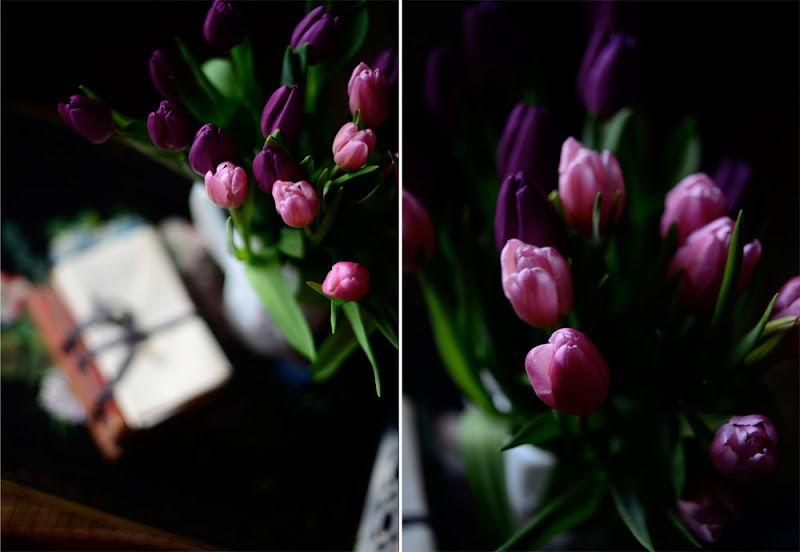 Tulips were my mom's favorite flower (I may have told you that on IG already), and they're mine, too. They say spring to me. I may play along on your Thursday prompts. I need inspiration, too! Pure loveliness. I am so looking forward to seeing them push through the ground. I like the idea of the Thursday prompt and would love to take part. But (rather ironically) we will be away from home this week until Thursday, so I won't be posting much of anything. I'll try for next week. The flowers are lovely....some of my favorite colors. And the prompt sounds like fun. I blog about my every day life so I'll ponder on this! Happy Monday! Sweet hugs! 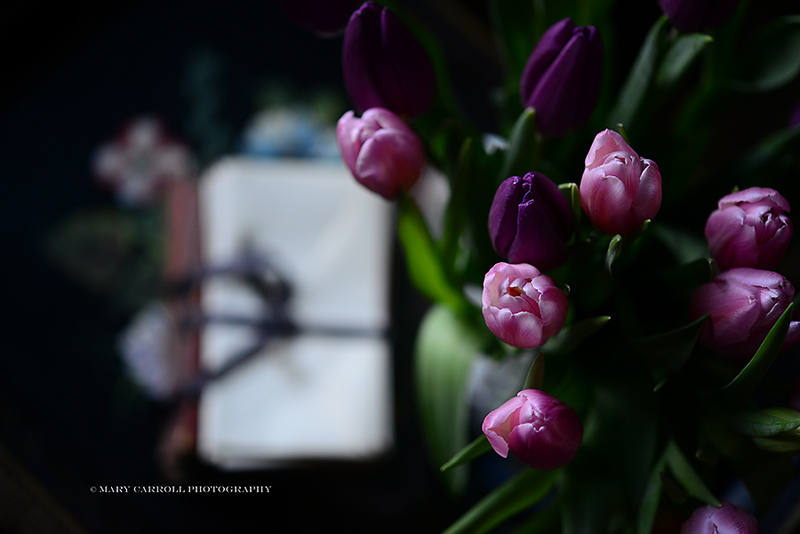 Gorgeous tulips Mary, I love the colour. The prompt sounds like a great idea, I'll be there. Mary I don't think you could ever be boring. Your photography is always a joy to me. 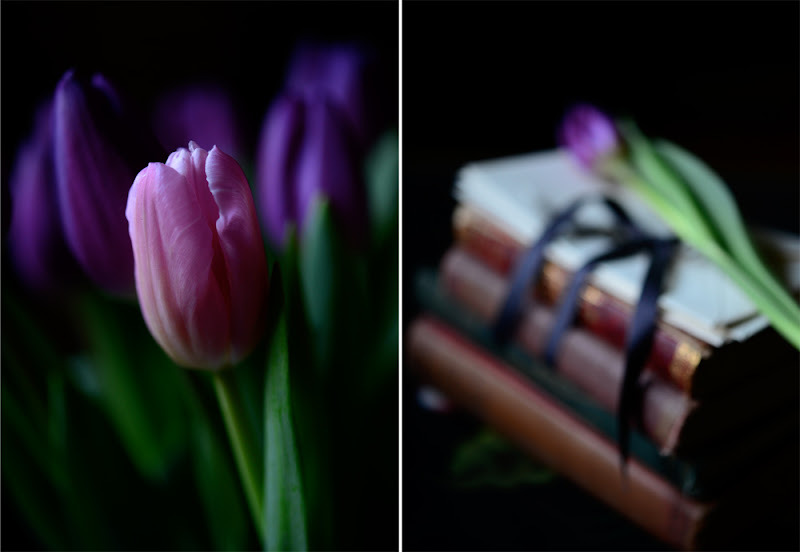 I love these images of the tulips. And I am thinking of doing some "on black" photography - so you have inspired me! I like the prompt idea. I am part of a project like that over on Flickr. A prompt really makes you get thinking to come up with some different and helps you learn along the way too. Have a wonderful week. and see you Thursday! Oh, Mary, those are gorgeous tulips! I "store bought" some orange ones last week and enjoyed them immensely -- but never took a single photograph. (They certainly wouldn't have looked as stunning as yours!) I've made note of your prompts, and my creative juices are already working overtime. I'll do my best to join you on Thursday. For now, you might find some inspiration here. I always do. Hi Mary, your photographs are always lovely and inspire me! Your new linky party sounds like fun. I would love to join in if I can figure out the prompts so lead the way.......Thanks for hosting Mosaic Monday. I love the idea of the prompts and your tulips Mary. I have had the winter blahs for awhile. My muse is fickle. Beautiful tulips. Yes, it is a time of year when inspiration can be hard to come by! 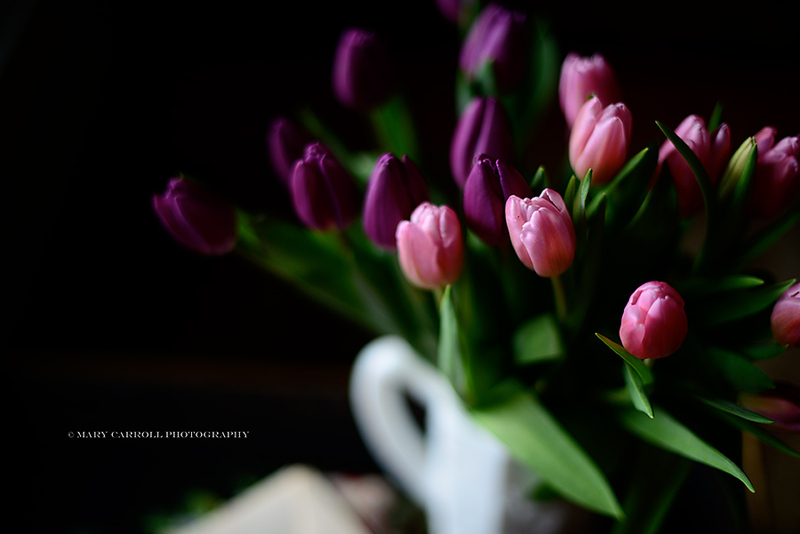 Lovely photos of beautiful tulips. I bought some in a similar color today. How do you get such a deep background to your photos? A new prompt is a great idea for the blogging doldrums that seems to set in around this time of year. The photos of the flowers are awesome....you really know how to use that camera. Prompts are always a good way to infuse "new blood" into a blog, I think. Mary, count me in, I have been in search of photography inspiration. Some days I don't know what to write about so I don't post anything. Before I know it a week might have transpired. I will get a call from my friend in New Jersey. "Hey where's your post, I was worried about you" I used to post so often. P.S. Your photographs are stunning, I love how you created the dark background. I usually love light backgrounds...but this literally took my breath away...kudos to YOU! 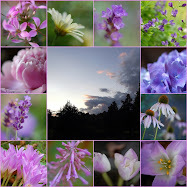 Your flower photos are always a joy to see, Mary! I'd love to join in on your prompt posts but this week will be a little hectic for us as our granddaughter is scheduled to be born! We are so excited! Your tulips are gorgeous . I love tulips and the colors are beautiful. colors I hear so many people saying they have no inspiration I have that prolem too. I am not blogging as much as I am used to also because there is not much to photograph in this gray weather we have here. I don't know what a prompt is so I will come and see on THursday what it is all about. Your photos are never disappointing. 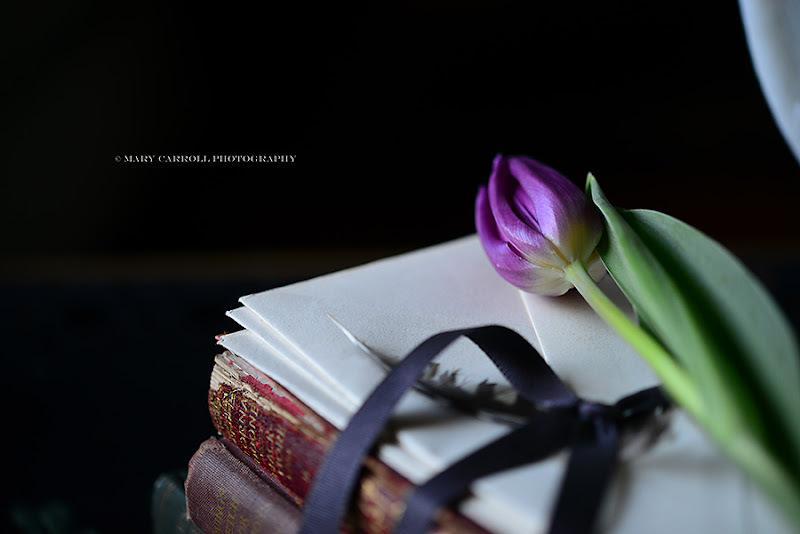 Mary, the tulip shots are gorgeous! The weekly prompt sounds like a great idea! Hi Mary,It's good to be back for Mosaic Monday I have been away for a few weeks and have missed all the fun. Your flower shots are gorgeous! I love the soft quality. I really like the sound of your weekly prompt. I'll have to see what I have for this week, but I'll certainly try to join in. Very new to the blog world, but have to say it is indeed sites like yours that have drawn me completely in and kept me coming back. Lovely you are!